Annan Athletic’s top goal scorer Peter Weatherson will be available for this weekends William Hill Scottish Cup tie against Hamilton after the clubs red card appeal was upheld. 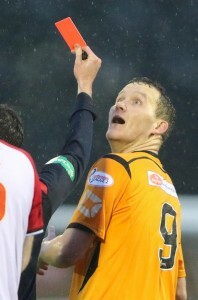 Weatherson was sent off for alleged violent conduct against Clyde almost 2 weeks ago but the judicial panel in Glasgow today rescinded the red card handed out that day. Its the first time since the club joined the league that they’ve appealed an officials decision.